Fantastic photos of a fantastic group! Don't forget to come along this Friday for more fresh air, fun and exercise.....starting at 10am. Things really are moving along, the bank account has been set up, all we need is some money to put in it. Good progress is being made with the grant applications, although i believe the paperwork is a bit daunting......you can never have too many forms. However maybe we should be thinking about other methods of fundraising, please put your thinking caps on so we have some ideas for the next meeting. Did you manage to watch the film "The Age of Stupid" on BBC 4 ? If you missed it you can catch up on BBC Iplayer until 21st December, it is well worth seeing. 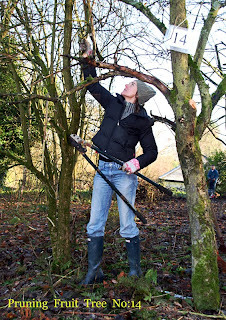 Prestbury Beaumont Apple Orchard – 11th December 2009 Report from Nicola, Team Leader. The winter moon still hung in a daytime sky lit by the brilliance of the morning sun. 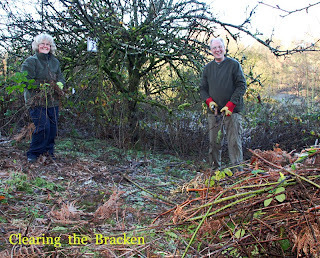 A thick hoar frost covered the ground paving the way to the orchard where bramble and bracken were usurping the ground in which the remaining eleven ageing apples trees stood. Here we gathered, laden with tools for the tasks ahead. This was our second working visit to Prestbury Beaumont where our task was to clear the ground and rejuvenate the old orchard. 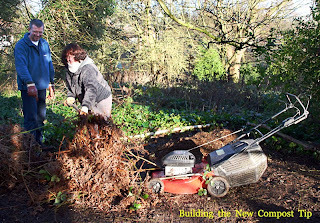 Ruth, Stuart and I set about clearing the bramble and bracken, which was transported to the composting area where Phil (our composting expert) sorted and shredded, creating a mound of sweet-smelling humus. Virginie (our apple tree expert) along with Bill, set to pruning an old plum tree whilst Judy (photographer) clicked and snapped us all at work. By the end of the day we were able to show Edwin (head gardener of Prestbury Beaumont) three of the trees that we had rescued from the dense undergrowth. A glorious day was had by all with satisfying results from just a few hours of work. Judy says - I was impressed with the start the team have made to the old orchard at Beaumont. Well done all of you - it is a great project. I have taken some photos of 'work in progress' which we will get onto the Food4Macc website. Meanwhile I have posted 3 of them here. Pictured are (left to right) Phil Shaw, Nicola Gower-Jones (project manager), Bill Pettipiece (deputy project manager) and Edwin Clarke (Beaumont's Head Gardener). Several other workers managed to avoid the camera! The first job was to begin clearing the ground around the existing apple trees in the old orchard, and to begin work on a compost heap. 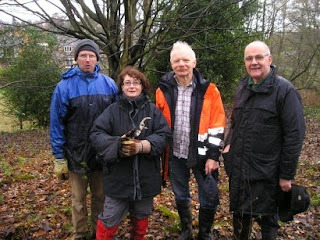 The second working party is planned for Friday December 11th, 10.30am - 2.30pm. Well this is the first post of our new blog.